Destroy target artifact. It can't be regenerated. 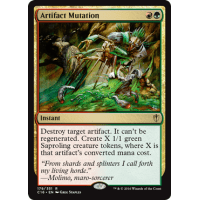 Put X 1/1 green Saproling creature tokens onto the battlefield, where X is that artifact's converted mana cost.